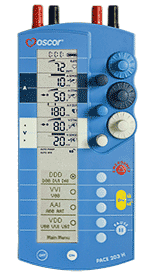 • Easy setup of stimulation parameters by ergonomically designed dials. • Large easy to read backlit display. • High rate function for rapid atrial pacing of up to 1,000 ppm. • Convenient measurement of P/R wave peak amplitudes. • Automatically adjusts settings for AV delay, PVARP and MTR. • Automatically tracks P/R wave peak amplitudes. • Automatic mode switch to asynchronous modes upon detection of interference. • Continuous surveillance of battery exhaustion and pacing lead system. • Customize, save and recall pre-set parameter values for quick setup. • Multilingual menu option (English, Spanish, German, French, Italian or Swedish). • Standard 9 Volt alkaline battery provides at least 8 days of continuous operation. • Compatible with Oscor ATAR™ extension cables and temporary pacing leads. • Attaches easily to bed or IV pole. is the third generation of the Oscor line of dual-chamber temporary cardiac pacemakers. Relying on over 25 years of experience in cardiac pacing, the PACE 203H represents the today's standard in temporary pacing technology and external dual chamber pacemakers. The PACE 203H is a state of the art dual chamber external temporary pacemaker offering easy access to all temporary pacing functions while offering state of the art features like pulse duration adjustments and balloon pump interface (outside US only). The Oscor PACE 203H is compatible with all Oscor temporary pacing leads and temporary pacing lead wires.